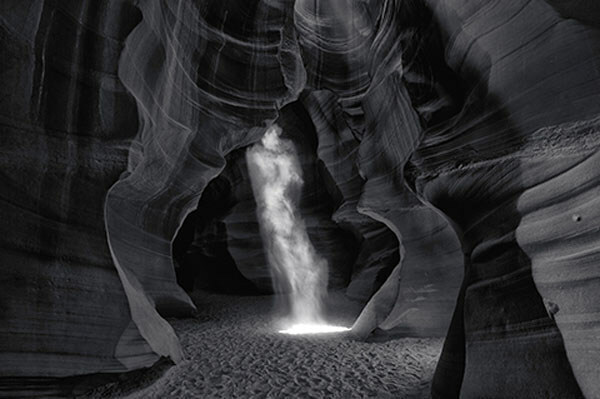 Recently, Peter Lik captured the world's attention with the sale of his photograph, Phantom, for an astonishing $6.5 million dollars, easily making it the most expensive photograph ever sold. This wasn't Lik's first foray into incredibly expensive photography sales, but it definitely set the bar higher for every other photographer in the world. Before this new record, however, he has had a long and distinguished careeer as a landscape photographer, among other things (such as, incredibly enough, hosting a television show on the American TV channel 'The Weather Network', entitled 'The Edge with Peter Lik', their first-ever original television show). Lik began his explorations in photography at the tender age of 8, when his parents gave him a Kodak Brownie camera, which as those of you interested in photography will know, was one of the first truly portable snapshot cameras, and was a wild success, being in production for something over 50 years. His first high-ticket sale was the photograph entitled 'One', which, as the name suggests, will only ever be printed once, helping to ensure that the $1 million USD paid by an anonymous buyer will be an investment well made. The photograph depicts the Androscoggin River in New Hampshire, USA. His production and printing processes are very specific, and tend to make up the large difference between what you or I might be able to produce with our natty little DSLRs and something that becomes worth $6.5 million. The majority of his work is shot using large format cameras, which dramatically increased the quality of the resulting image, and when he makes prints, they are printed on a high-quality FujiFlex silver halide emulsion, which can increase the sense that they have a kind of light-emitting glow. This is all incredible enough, but it becomes even more impressive when you learn that Lik is entirely self-taught as a photographer. New York School of Photography, eat your heart out. He's a testament to the fact that passion is a more effective driving force for knowledge and learning than any schooling can be, and that the most important thing you need to succeed in your own artwork is a powerful passion and determination to continue refining your technique.